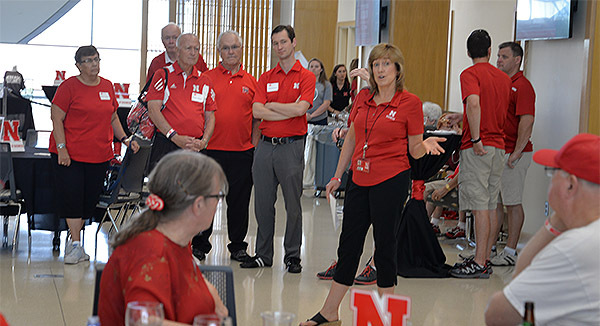 Dean Kathy Farrell welcomes fans to the Nebraska Business Alumni Tailgate last year. The College of Business celebrates the first anniversary of Howard L. Hawks Hall at the annual Nebraska Business Alumni Tailgate on Saturday, September 29, 11:30 a.m.-2:30 p.m. Alumni can reconnect with faculty and staff at the event while enjoying food and beverages before the homecoming football game against Purdue. Attendance at the tailgate requires $10 pre-registration at: https://business.unl.edu/alumnitailgate. Business alumni and guests can tour the new 240,000-square-foot building and choose from Nebraska swag, such as sunglasses and clear totes, both allowed inside Memorial Stadium, which will be available on a first-come basis. Celebrating milestone graduation anniversaries, alumni from these honored classes will be recognized at the tailgate: 2008, 1998, 1988, 1978, 1968, 1958 and 1948. Guests show their Husker spirit at last year's alumni tailgate. Farrell, who was appointed the permanent dean in December of 2017, will share updates on the college and insight on the new college strategic plan. Beginning last spring, the intensive planning process involved nearly 50 faculty, staff, students, alumni, business partners and university representatives. Tailgate registrants who show their tickets for the Purdue game at the Huskers Shop will receive 20 percent off of Huskers apparel and merchandise. Located in the Welcome Center on the first floor of Howard L. Hawks Hall, the Huskers Shop is a joint effort between Nebraska Athletics and Fanatics, a retail apparel company. The Department of Interior Design partnered with Nebraska Business to provide the best store layout to maximize the space and utilize the sales data gathered from purchases in various business courses.